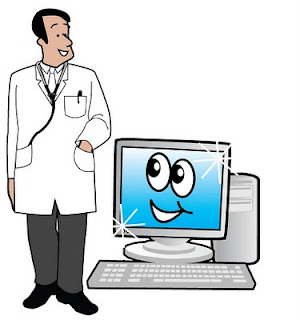 Dr.Malpani's Blog: How technology helps doctors save time! This is a guest post from Aditya Patkar, Marketing Director, Plus91. Doctors need to incorporate technology in their daily life to increase their efficiency. Let’s look at how Dr. Thakkar can use everyday easily available off-the-shelf inexpensive technology intelligently, to help him become more productive. .
a. Dr Thakkar’s contact Information with a google map is readily available , so that his staff does not have to waste time giving directions to patients as to how to reach the clinic ! c. Patients from all across the world can now easily email their queries to Dr. Thakkar. This can help him to provide services remotely to his patients, improving his service levels and connectivity with his patients, and allowing him to attract patients from all over the world ! d. Dr. Thakkar does procedures where he needs to give instructions to his patients for pre-procedure preparation and postoperative precautions . Often patients forget the details, and keep calling him when he is busy in his clinic. These interruptions upset his workflow and concentration. Now he can re-direct them to his website , where all the instructions are written down in great detail , in multiple languages! a. Dr. Thakkar can now check his daily schedule on a mobile phone. The latest smart phones come with many calendar features and schedulers with alarms. Also by using Google Calendar or innovative EMR solutions , he can get reminder SMSs on the phone for appointments and operations. b. Dr. Thakkar can access his Email on his GPRS enabled phone , which can let him see the latest blood report of his patient and take decisions quickly. c. The latest phones also come with high quality cameras, so that he can now store X-Rays and reports as images at the click of a phone button.The latest EMR solutions now allow you to directly attach these images to the patient’s records also! d. The phone also comes with GPS navigation systems. Dr. Thakkar can get where he wants to go quickly and safely, especially if he is doing a house visit . 3. Pen Drive: A pen drive is a small and low volume file storage system. a. Dr. Thakkar can carry all his patient reports and word documents in his pen drive, which means he no longer needs to lug a brief case around to all the hospitals. go. This saves him time , as he does not need to burn CDs , or search through many papers. The data all the drive is all well-organised neatly into folders. a. Dr. Thakkar can optimize the use of all this technology by having his own PC or laptop. Now all his data can be soft copy, easily transferable, viewable, and most importantly , searchable with ease! b. Dr. Thakkar can now access his emails and patient documents quickly and anywhere on his laptop. c. Dr. Thakkar sometimes has queries on new medicines and procedures. Now he doesn’t need to wait to read a journal or attend a conference. He can simply go onto the internet and search MDConsult ( www.mdconsult.com), the world’s largest online medical library. Why wait when all the latest medical information is all at your fingertips ? This saves you time, impresses your patients – and ensures you are at the cutting edge of medical science ! d. Dr. Thakkar need not wait for hard copies of patient reports and test results. Now he can have the soft copy emailed to him so he can check them in his office or on his laptop on the move. This saves him time later – and his patients are grateful, because he does not need to make them wait for a diagnosis. a. An intelligent EMR such as KlinCare saves Dr. Thakkar time and improves accuracy in retrieval of patient records. He can also analysemedical statistics keep his accounts, check his inventory and even manage referrals . b. He can email reports and send SMS reminders to patients directly from theEMR . Now Dr. Thakkar is always on time and so are his patients, so they do not waste time waiting. c. Dr. Thakkar likes to send his patient’s case reports to the referring doctor. He can now instantly email the report to his colleagues – who are very impressed with his promptness, and are happy to refer more patients to him ! These are just some inputs on how technology can help doctors make better use of their time, so that clever doctors like Dr Thakkar have more time to spend with their family ! Can you afford to lag behind ? To know more about how we help you save time and improve your productivity , please visit www.plus91.in. If you need hand-holding and guidance, Plus91 offers free seminars for doctors, to help you learn how to master this technology as well !